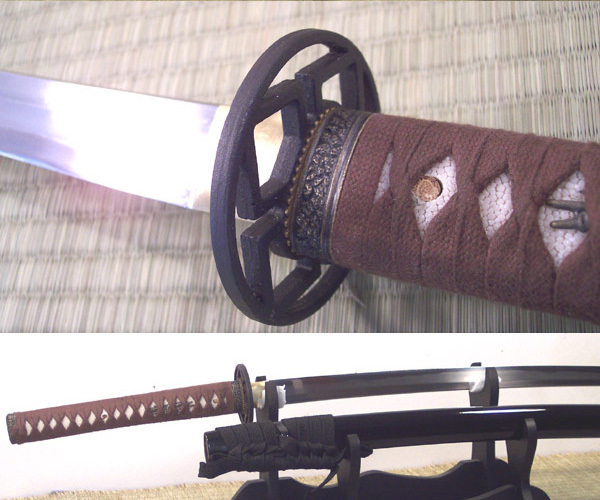 Hand clayed and differentially hardened, what makes the Kaze unique is the use of the revolutionary 9260 Spring steel: a perfect combination of age old art with cutting edge modern metallurgy giving it a beefy but extremely sharp blade. 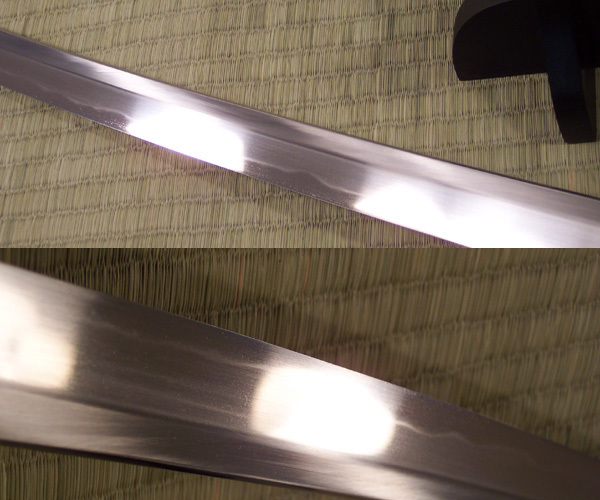 Unlike just about every other production sword on the market in this price range, the Kaze has a totally authentic, unenhanced Hamon temper line (other production swords typically all have acid etching or wire brushed hamon). While the hamon is subtle (as the polish to bring it out to its full potential would double the cost of the sword) the 9260 Spring steel results in a very distinct pooling of the nie crystals, making for a nicely defined hamon line. 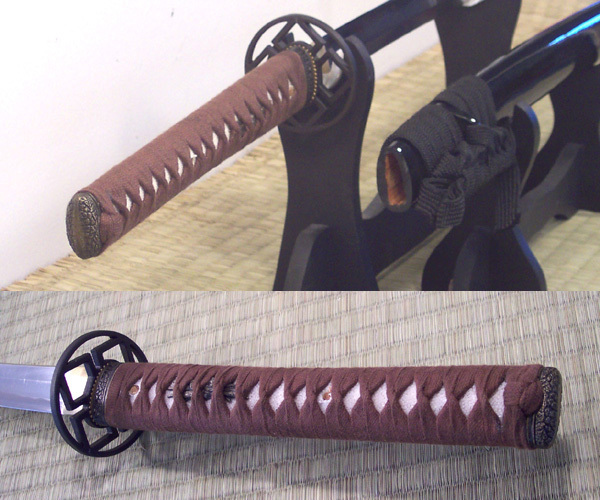 The fittings include a blackened steel replica of an actual antique tsuba, one brass menuki peg for additional tsuka structural reinforcement over the full tang and thick tsuka with real rayskin panels housing the blade that cuts traditional targets like a laser, which is why I have nicknamed it 'the Tatami Killer'. For more information and test cutting results on the Kaze, check out the full review here on SBG. Great value, one customer described it as "One third of the price of a Hanwei Great Wave ($945) but just as good"
Differentially hardened 9260 Spring Steel sharpened blade with real hamon. Cotton ito wrap over authentic rayskin handle. Brass Fittings. This is my first real Katana. Purchased after reading reviews on SBG and couldn't be happier. The Kaze is a great sword. Great Balance and solid. I haven't used it for cutting yet, as I want to be sure I can cut very straight before an attempt, but the sound it makes while cutting air (The Kaze sound) is crisp. It has a good weight and is pretty solid. I went with the brown Ito wrap and it looks really nice. I would recommend this to anyone that wants a "real" differential hardened blade and doesn't want to spend thousands. 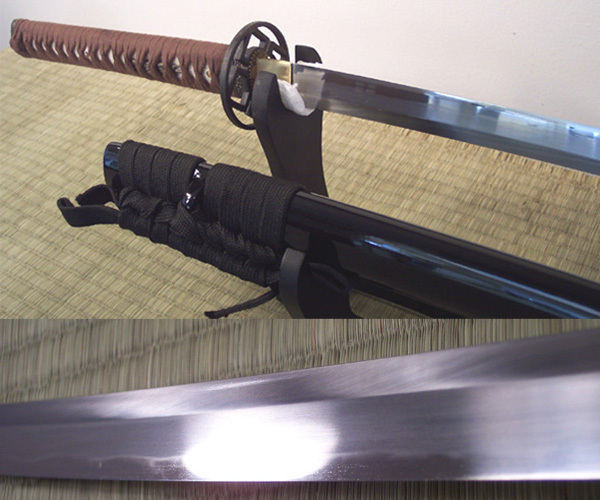 I have heard people say 9260 steel is not perfect for a differential hardened blade, but if you know anything about how Japanese Sword Master-Smiths "make" their swords - they actually pick lumps of raw-iron "steel" based on the color and the feel. Then they forge and fold that steel to remove impurities. 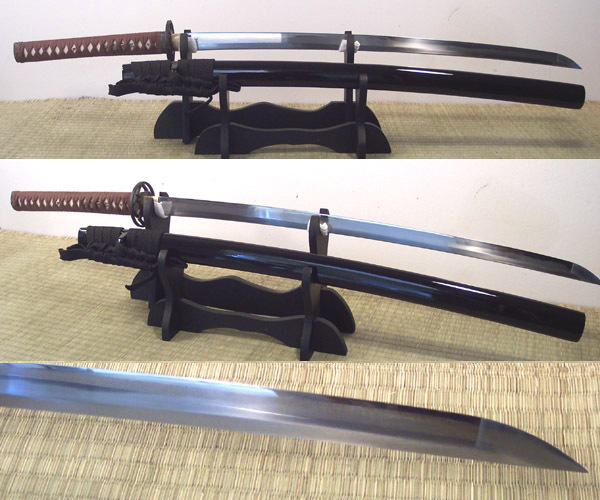 Thus 2 swords side by side can have vastly different carbon content in the construction of the steel as the method used to chose the steel is based on feel and looks not scientific evidence. Not trying to knock the Master-Smiths that do this, they are true masters... But it is worth noting that 9260 steel is solid with a consistent carbon content from blade to blade. Add to all of that the fact that the blade is a thick no-hi 2lb-9oz cutter and you have a solid modern version of an old sword. I think it is the best of all worlds.